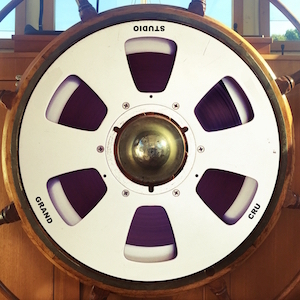 "Sonic Excellence, Heritage, History and Fun... On a Magnificent Dutch Barge"
Grand Cru Studio is a high quality commercial recording studio on a 100 year old, 110 foot Dutch Barge, moored in Central London. Pete Townshend had the barge converted into a studio in the late 1970's. Until now, it has mainly been used exclusively by a select few, and spent 33 years moored outside Pete's main studios near Twickenham. In 2009 the barge left Twickenham and sailed to it's new home St Katherine Docks, a beautiful marina with shops, cafes, restaurants, pubs, bars and plenty of history. The current studio has been built up over the past five years to cope with a number of wildly different and demanding projects. The result is a high quality, great sounding and well equipped writing, recording and mixing studio. It is available to hire with producers, engineers, or assistant engineers.